THE INFLUENCE of McIntosh on the world’s apple supply extends well beyond the McIntosh itself. 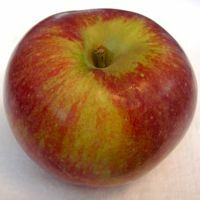 Its exceptional flavor, juiciness, and aroma have made McIntosh a favorite of apple breeding programs for more than 100 years, and Macs are parents of some of New England’s most celebrated varieties, especially Cortland, Empire, and Macoun. Like McIntosh, Cortland has been a New England favorite for more than a century, and it excels in every use. A large, juicy apple with a sweet-tart flavor that is a little sweeter than a Mac, Cortlands are excellent for fresh eating. They are outstanding in pies for their flavor, size, and because they hold their shape well when baked. Their white flesh browns slowly after slicing, so Cortlands are excellent in salads, too. Cortland is the product of a cross between McIntosh and Ben Davis, an heirloom apple from Virginia dating back to the early 1800s. 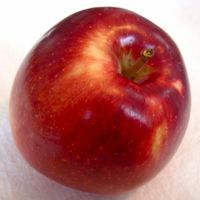 Much of Cortland’s distinctive flavor comes from McIntosh, while its crisp texture, red skin with green striping, and large size are characteristic of Ben Davis. Cortlands can develop a slightly greasy look and feel in storage, another quality of Ben Davis. Cortlands were developed in 1898 at the New York State Agricultural Experiment Station in Geneva, New York. 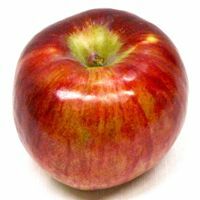 Empire is a cross between two of America’s most popular varieties: McIntosh and Red Delicious. Red Delicious, a chance seedling discovered in Iowa in 1880, provides Empire’s predominantly deep red color and sweetness, but McIntosh gives it a complexity and measure of tartness, as well as a green or yellow blush. Empire’s juicy white flesh resembles a Mac, but it is firmer and does not bruise easily, like Red Delicious. Empire is great for fresh eating, but is a good cooking apple as well. Developed by R.D. Way at the New York State Agricultural Experiment Station in 1945, Empire was introduced commercially in 1966. Macoun was also developed at the New York State Agricultural Experiment Station, by crossing McIntosh with Jersey Black, a variety from New Jersey also known as Black Apple, dating back to the early 1800s. The resulting apple is named for Canadian horticulturalist W.T. Macoun, and it was released in 1923. Many consider Macoun to be the finest fresh-eating apple available, in large part due to its sweet-tart, McIntosh-like flavor and powerful fragrance. But Macoun has a firmer, crisper flesh than McIntosh, and a distinctive, spicy taste, with a hint of strawberry. Other varieties that owe their existence to McIntosh include Brock (crossed with Golden Delicious, developed in Maine in 1933), Jonamac (crossed with Jonathan, New York, 1972), Milton (crossed with Yellow Transparent, New York, 1923), Spartan (crossed with Newtown Pippin, British Columbia, 1936), and Spencer (crossed with Red Delicious, British Columbia, 1959). RubyMac is one of several newer strains of McIntosh, and it is distinguished by its deep red color and firm, light-green flesh. 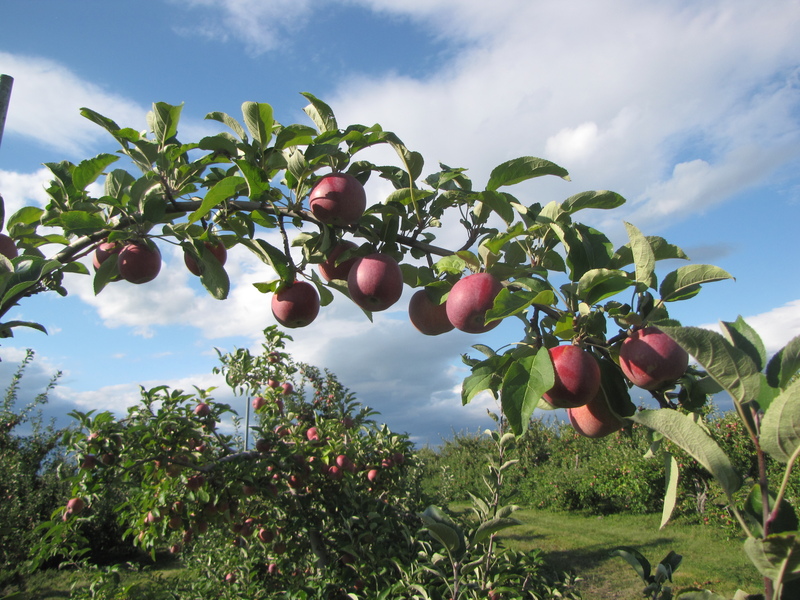 FOR INFORMATION about where to find McIntosh and other New England apples, click here. A new logo on New England Apple Day!